Photographer Robert C. “Bob” Tong started with the Marin Independent Journal as a paperboy and went on to become an award-winning photojournalist there. The Novato resident loved to take pictures of firefighters, sports, music performances and everyday life in the Bay Area. You can see the beautiful results in this photo essay tribute and also read why his editor, Robert Sterling, loves these images. In October Robert Tong died at age 58. Bob probably took hundreds of photos of the Golden Gate Bridge, both beautiful scenic shots and others that had to do with news — work on the bridge, automobile crashes and more. Here he captured a moment when the fog drifted across the bridge during the evening commute, as seen from Vista Point on December 9, 2004. Bob had an eye for the everyday slices of life. This is a fun photo that is also something of a time capsule, taken near the entrance of the Marin County Fair on July 5, 1988. In the booth on the right, Randy Allen tries to get in one more phone call before Pacific Bell workers Anne Reagan and Mark Krueger take down the pay phones that had been temporarily installed on the fairgrounds. Community journalism at its finest: Lucy Broom reacts after having her hair cut by Sam Burke in Mill Valley on May 19, 2004. Lucy and five others in her Old Mill School third-grade Brownie troop held a cut-a-thon, in which they each had 10 to 12 inches of locks shorn for donation to the nonprofit Wigs for Kids, to benefit children affected by hair loss. Bob was at Candlestick Park for the start of Game 3 of the World Series between the Giants and A’s when the 6.9 Loma Prieta earthquake struck. Here, baseball fans with a portable TV watch live video of the fallen Bay Bridge on October 17, 1989. Marin of course was the home of the Grateful Dead, and Bob captured multiple concert images, including this one of Jerry Garcia at the Oakland Coliseum on July 24, 1987. Bob loved to shoot baseball, and he made sure not to miss the Giants’ playoffs and World Series runs. Here he captured Barry Bonds’ reaction to J. T. Snow’s game-tying home run in the bottom of the ninth while playing the New York Mets in the National League Division Series on October 5, 2000, at what was then called Pac Bell Park. For a story about the kayakers who wait patiently for “splash hits” in the waters off AT&T Park, Bob got into a kayak himself and hung out during Game 1 of the Giants-Rangers World Series on October 27, 2010. Bob’s specialty was fire. He had a certain affinity for photographing both structure fires and wildfires; he was good at it and he gained the respect of Marin firefighters, who gave him special access. This was a conflagration in July 1990 — a spectacular fire that severely damaged a convent near Dominican University. The Vision Fire in the Point Reyes National Seashore covered 12,354 acres in Marin. Here, Marin County seasonal firefighter Erik George takes a break after working all night to save a home along the road to Limantour Beach on October 4, 1995. Novato Fire District’s new Type 1 engine had been in service only about six months in the mid-1980s when it caught on fire during a training exercise at Hamilton Field — and Bob was there. Amid the fury of a water polo match, Bob’s camera lens caught Sir Francis Drake High’s Greta Stout in action as she brought up the ball against Marin Catholic in the MCAL girls’ water polo championship on October 28, 2017. The photo was among those honored this year in the annual California News Publishers Association contest. 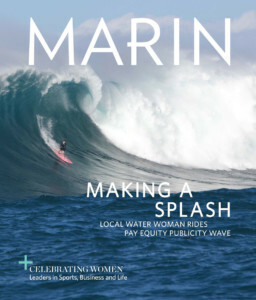 This article originally appeared in Marin Magazine's print edition with the headline: "Eye for Life".